Lady Panthers Take on Vista Ridge HS! 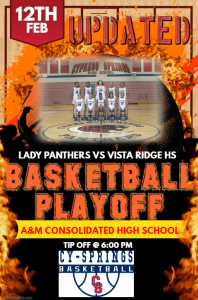 Make the trip up to A&M Consolidated HS to support our Lady Panthers in the first round of the playoffs! Tip off will be at 6:00 pm.